In the course of a minute-long speech, Tulsi Gabbard of Hawaii was introduced Tuesday to a nationwide audience of Democrats at the party’s national convention. Stephens Media. Hawaii congressional candidate Tulsi Gabbard had a brief but noteworthy moment in the national spotlight Tuesday, one of three women with Hawaii ties to address the opening day of the Democratic National Convention. Star-Advertiser. The Democratic National Convention kicked off Tuesday in Charlotte, N.C. with one of Hawaii's delegation taking center stage. Hawaii News Now. "Aloha! I'm Tulsi Gabbard, candidate for congress in Hawaii and a captain for the Hawaii National Guard," began Gabbard at the DNC in Charlotte, North Carolina. KITV4. 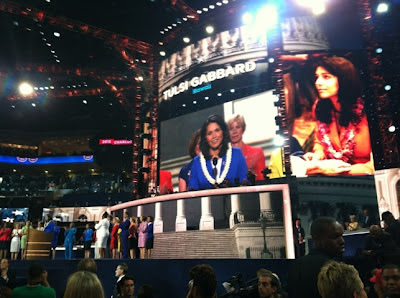 Gabbard was one of three women from Hawaii to speak at the convention on Tuesday. Congressional candidate Tammy Duckworth and President Barack Obama's half-sister, Maya Soetoro-Ng, also spoke at the convention. KITV4. A total of 38 delegates comprising the Hawai‘i delegation to the Democratic National Convention arrived in Charlotte, N.C., Monday. Garden Island. Kawika Crowley, GOP nominee for the 2nd Congressional District, knows he’s occupying the underdog slot in the November General Election. West Hawaii Today. The Hawaii Tourism Authority has reappointed Ronald Williams as board chairman, and named Patricia Ewing as vice chair. Pacific Business News. The Office of Hawaiian Affairs announced today that it has hired Kawika Riley, a former spokesman for the federal Transportation Security Administration, as its new Washington D.C. Bureau Chief. Hawaii Reporter. There are 63 days left until the General Election, November 6th . Few, if any, state legislative races are polled during the election season … leaving most contests nearly impossible to call. Hawaii Public Radio. Hawaii Board of Education members want school officials to respond to the state auditor's recommendations on ways to fix the district's broken school bus program. Civil Beat. Over the next several months, the Department of Education hopes to contain student transportation costs and develop a long-term plan for reining in spending, the head of school support services told Board of Education members Tuesday. Star-Advertiser. The U.S. Fish and Wildlife Service and conservation groups have moved more endangered birds from Nihoa Island to Laysan Island to boost the species' chances of survival. Associated Press. Volta Industries plans to triple the number of free electric-car charging stations in Hawaii by the end of this year, as well as expand nationally, thanks to a $200,000 investment by Hawaii Angels. Civil Beat. State roundup for Sept. 5. Associated Press. There are three contested races for Honolulu City Council, and each one has a candidate who has spoken out against the $5.26 billion project. Civil Beat. September 19 Meeting Focuses on Sustainability Plan for East Honolulu. Hawaii Reporter. A U.S. State Department special agent who shot and killed a Kailua man while in Honolulu for the Asia-Pacific Economic Cooperation summit in November might not stand trial after all. Civil Beat. A man who stabbed two hikers at the top of the Koko Crater Trail but was acquitted of attempted murder by reason of insanity continues to attend classes at Windward Community College. Star-Advertiser. There are new reports of coqui frogs on Oahu -- one frog in Waimanalo, the other in Makaha. KHON2. The county Board of Ethics is poised to wade into the morass of accusations and recriminations surrounding the county Elections Division. West Hawaii Today. The Hawaii County Council on Thursday will discuss legislation addressing the county’s primary election day problems. Tribune-Herald. Plans for a new apartment complex could help address a shortage of housing for University of Hawaii at Hilo students. Tribune-Herald. Endangered Hawaiian hoary bat rescued, rehabilitated. West Hawaii Today. The Hawaii Attorney General's office has issued a report accusing the Wailuku Main Street Association of failing to comply with its governing documents and violating its statutory duties. Pacific Business News. Wailuku Main Street Association's (WMSA) board "violated their statutory duties of care in numerous respects" and should terminate its executive director, according to a state Attorney General Office's report released to requesting media this morning. Maui News. For the first time in a dozen years, regularly scheduled air service will resume in the remote East Maui town of Hana. Maui Now. Nearly one-fourth of all living coral in west Maui has been lost in the last 13 years. KHON2. Former NASA astronaut Leroy Chiao will speak about his various space missions and his work with Russian, Japanese and European astronauts at a presentation at 5:30 p.m. Sept. 13 in the Cameron Center Auditorium. Maui News. The Environmental Protection Agency has recently released a complaint to Tahiti Nui Restaurant and Cocktail Bar for failing to close its three large capacity cesspools. The organization is seeking penalties of up to $177,500, the amount authorized under the Safe Drinking Water Act, in addition to prompt closure and replacement of the cesspools with an approved wastewater system. Garden Island. The 5-acre Kilauea Farms estate on Kauai’s North Shore is being auctioned on Sept. 20. Pacific Business News. A Kaua‘i hang gliding outfit is suing two tour-scheduling companies for what it claims are disparaging comments that have led to a loss of business. Garden Island.